And what is there to look at from the Meadowlands? Aside from pretty nice Downtown and Jersey City views, all you get is: the rest of New York skyline, greatly obscured by the 200' ridge of the Palisades; stadiums and gigantic parking lots in the foreground; the Turnpike and related interchanges, packed with Lincoln Tunnel-bound traffic; the swamp, marred by office parks and transmission towers; and suburban sprawl. Would it ever be something worthy of a return visit? Staten Islanders tongue-lashed a proposal to build the world's largest Ferris wheel in a hurricane evacuation zone during a public meeting Tuesday night, questioning both whether it would hold up during a storm of Sandy's magnitude and also the decision to go ahead with the meeting despite continuing recovery efforts. The 625-foot-tall wheel would be located near the St. George Ferry Terminal on Staten Island. The project is backed by New York Mayor Michael Bloomberg and the New York City Economic Development Corporation, the city's representative on major development projects, but would be funded with $250 million in private investment. Among those opposed were an Occupy Wall Street protestor and a man wearing a "GREED KILLS" t-shirt, who directed particular ire at the president and CEO of developer New York Wheel, LLC, former Bear Stearns banker Rich Marin. But the harshest criticism may have come from local City Council member Debi Rose. Rose stood side by side with Mayor Michael Bloomberg and the wheel's developers when the Ferris wheel idea was unveiled in September. On Tuesday night, she stood up with something different to say. "Everyone knows that Staten Island was ground zero for Hurricane Sandy," Rose said. The meeting "should have been postponed, but it wasn't." Her criticism of the meeting's timing echoed comments earlier in the day from City Council Minority Leader James Oddo to the Huffington Post, and a letter from all three Staten Island City Council members to New York City Deputy Mayor Robert Steel. Were Rose and those council members to turn against the project, they could doom it. The City Council will need to approve zoning changes for the plan to go forward, and members from other areas are generally deferential toward local representatives. That does not seem to be happening so far: Rose, Oddo and Council member Vincent Ignizio also said in their letter that they were "generally supportive of the project." Members of the general public, however, were far less forgiving at the meeting. "It's sort of like an insult to our residents here, that we're just trying to embrace a wonderful time [the Ferris wheel] when people are so devastated," said Nancy Rooney, a nurse. "I think the timing is poor and we need to reconsider our priorities on this Island." Stephanie Woodard said during the meeting Tuesday night, "Part of our island was just devastated in the floodplains. And this is actually going to be built in the floodplain: enormous, vulnerable structures." "After they've had to clean up a few times, are they just going to leave us with a rusting pile of junk?" she asked. "What's going to happen to it? Where's it going to fall and who's it going to fall on?" The question of whether the Ferris wheel would be able to withstand hurricanes will likely play a major role in its approval process in the wake of Sandy. New York Wheel said its structure would be designed to withstand 300 mile per hour winds -- far stronger than those of the most recent storm -- and that the Ferris wheel would also be able to ride out surges. But the developers have acknowledged that their project lies in 100- and 500-year FEMA floodplains. David Goldfarb, the corresponding secretary for the St. George Civic Association, claimed that a previous proposal for the land near the ferry acknowledged that much of it would be unusable due to flooding concerns. In an interview after the meeting, however, Marin of New York Wheel claimed that the structure would actually improve the area's protections against the sort of deadly storm surges that claimed many lives on Staten Island during Sandy. The wheel would block powerful surges from hitting a retaining wall that protects Richmond Terrace, a major thoroughfare on Staten Island's North Shore, and the utility lines behind it. "The elements don't smack up against that wall and cause potential deterioration or breach of that wall," Marin said. He also brushed away concerns over the timing of the meeting and the speed with which the proposal is proceeding. In light of the "devastation" caused by Sandy, he argued, citing the long rebuilding process for Lower Manhattan after 9/11, "the fact that we were already in process was a stroke of good fortune for this island. "Where else is Staten Island going to see $500 million in private investment coming to its shores to be built and be productive within three years?" Marin was similarly dismissive of the references to his past at Bear Stearns. In 2007 he was fired from his job as chief of a division of the company that managed two troubled hedge funds, due in part to criticism of his reviewing the Kevin Costner film "Mr. Brooks" while the company imploded at the start of the financial crisis. "Sure, I've fallen down, like a number of people have, over the years," Marin said on Tuesday night. "But I've done a lot of good things. People keep giving me the responsibility to do big things. I must be doing something right. And my guess is that this is a going to be very succesful project and my investors will be happy that I was doing it for them." The engineers here have final say, but with that design it doesn't look like it to me. That girder base - for lack of a better term - just doesn't look strong enough. And they should be spread wider apart. You mean like the Parachute Jump? No. Just the legs, for lack of a better word. The one in Seaside, even though it had those girder-looking legs, had 8 of them (2 for each support) so even though the pier was destroyed, the wheel still stands because it was built on the braces that hold up the boardwalk, and the girders were spread wider apart and that wheel isn't even that high. Though, I saw a youtube video that shows before and after, and it looks like it has shifted, but it definitely can be saved. If I find the video I'll post it. But this wheel looks top heavy in the rendering. The Wildwood one isn't that high but has a stronger base. Even if they stick with the girder support-type base, they really should redesign it for high winds. Maybe in light of Sandy, they will. My point is that the Wheel is like the Parachute Jump, with most of the mass in the support. The Wheel is like a bicycle wheel; much of it is lightweight cable, so the center of mass is lower than the heavier steel Wildwood. It was announced in February that Dubai is planning a taller wheel. You know the huge Ferris wheel—to be the world's biggest if actually built—planned for Staten Island? Well, the New York Wheel's developers are working hard on making it happen—and there might be Google Glass. ALL HAIL, GOOGLE GLASS. Technology and social media are playing a crucial role in the design of the wheel. Developers are in talks with Google to use its technology, like Google Glasses, to offer riders an augmented-reality experience. Carts will feature touch-screen glass to add to the multimedia experience, which could incorporate brand messaging. A New York Wheel app will provide information on the structure, as well as on the metropolitan area, and could serve as another advertising platform. But developers are most focused on the social aspects of the New York Wheel. The site will be wired and equipped with all forms of technology, including cameras and tablets. "By allowing riders to share their experience, we are extending the reach globally," Mr. Taggart said. Also, the ride itself will be 38 minutes. The New York Wheel will cost $500 million to build—right now, construction is supposed to start next year and be completed in 2016. © 2003-2013 Gothamist LLC. All rights reserved. WOW 500 million to build a Ferris wheel, that seems high. The London Eye cost £70 to build in 1999. Damn that inflation! Doesn't that figure also include the outlet mall that's going along with it? 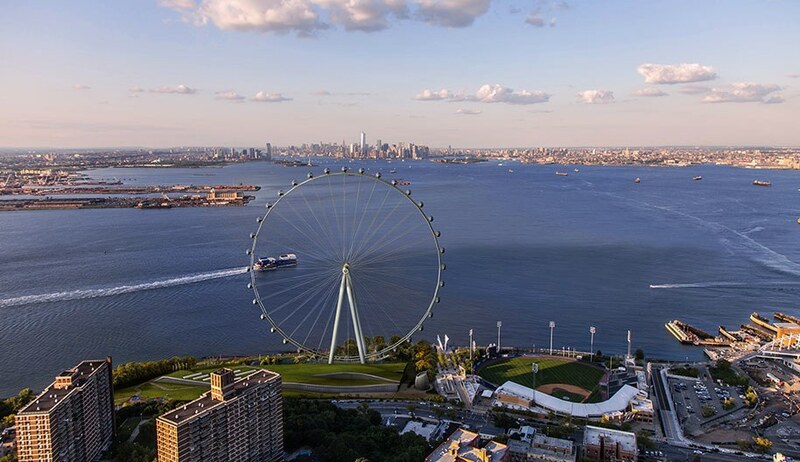 A rendering of the New York Wheel proposed for Staten Island. One of the world's largest Ferris wheels is set to roll into Staten Island. 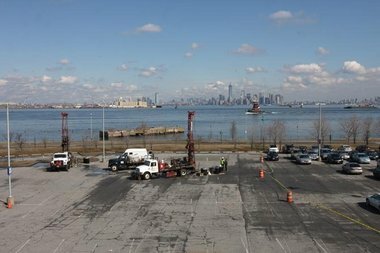 The City Planning Commission is expected to begin the public review process on Monday for the New York Wheel, the King Kong-sized carnival attraction that will spin some 630 feet over the harbor in St. George, Staten Island. The wheel is part of a larger project being underwritten by the city's Economic Development Corp. that also includes the first outlet mall in the five boroughs. The developers will need to wait until after the six-month review process before construction can commence. "After months of careful planning with the community, we're excited to get this project rolling," said Rich Marin, CEO of New York Wheel, the Ferris wheel's developer. "We think it will be a unique addition to the skyline—and a great place to see the skyline from." Mr. Marin said the project has changed little since it was http://www.crainsnewyork.com/article...TATE/120929906 unveiled at the end of September, though the budget has now grown to $300 million, from an original projection of $250 million. The actual wheel measures 600-feet high and will be accompanied with a 950-space parking garage and 100,000-square-foot, environmentally focused visitor center alongside it. "Once you start working with the city and the community, you end up putting on a few new doorknobs and whistles," he said. Already, the project has been expanded to include new additions such as a playground on the six-acre landscaped roof, which doubles as a publicly accessible open space. The project will also be built to new flood-resistant standards, given its proximity to the waterfront. Additionally, the developers agreed to improve a section of the esplanade that separates the ride from the harbor, to better integrate the two spaces and help protect against future storms like Sandy. "There have been a few small concerns, but mostly it's been excitement and anticipation," said Vincent Accornero, chair of Staten Island Community Board 1's land-use committee. "It's certainly the largest privately funded project we've looked at in my 25 years on the community board." The wheel may create an issue with condo owners living uphill from the project because they've long enjoyed unobstructed views of Manhattan and the Statue of Liberty. Mr. Accornero said the New York Wheel team has worked to keep the structure slim and unobtrusive, but the wheel is designed to light up at night. That might irk neighboring homeowners. Mr. Accornero said the community is still trying to figure out the best way to lure any visitors to the new attractions into the St. George neighborhood. A big part of the reason the city is pursuing the wheel and the neighboring outlet mall project is to get the 20 million tourists who ride the Staten Island ferry each year to actually stick around rather than simply re-board the ferry and return to Manhattan. "We want to make sure it's an open site, and we're working with EDC on that, but ultimately it's up to the chamber of commerce, the business owners and the cultural institutions to make sure people know they're here," Mr. Accornero said. The other challenge will be promoting the Ferris wheel itself with stiff competition from halfway around the world. Mr. Marin has to compete with a new wheel in Dubai, which was announced in February and will be 688-feet high. The Dubai wheel will also be designed by the same European company. But Mr. Marin, who had topped wheels in Las Vegas, London and a few Asian cities, said he gave the designer his "blessing to work on the project" and is unfazed by the pending rivalry. "It's about size, but it's also about location," is added. "And I'm sorry, but Dubai has nothing on the Statue of Liberty, the World Trade Center and the rest of New York." Let's see how long it takes to get this off the ground. Well, not literally. If they have to name it, hope it's something to do with wheels or circles. We already missed out on Jet Blue Stadium.